Nimbuzz is a new-generation mobile service, which enables people to do free & low cost mobile calls, free Instant messaging and social networking on a go. Nimbuzz supports many social networking sites like Skype, Facebook, Windows Live Messenger, Google Talk, Twitter, Yahoo, AIM, MySpace, ICQ, GaduGadu, Hyves, StudiVZ, Giovani and others. Using Nimbuzz, you can communicate from mobile to mobile, mobile to PC/Mac and vice versa, with Wi-Fi, 3G, 2G, GPRS. 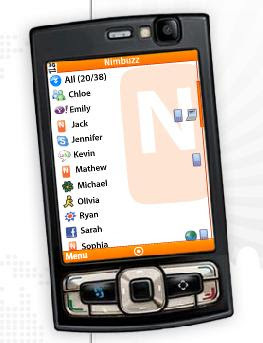 Nimbuzz also provides wide support to all major platforms like Symbian, iPhone, iPod touch, Windows Mobile, Android, BlackBerry, J2ME, as well as Windows and Mac desktop computers. Download Nimbuzz and try now.